The McKethan Lake Recreation Area is part of the Withlacoochee State Forest Headquarters Tract. 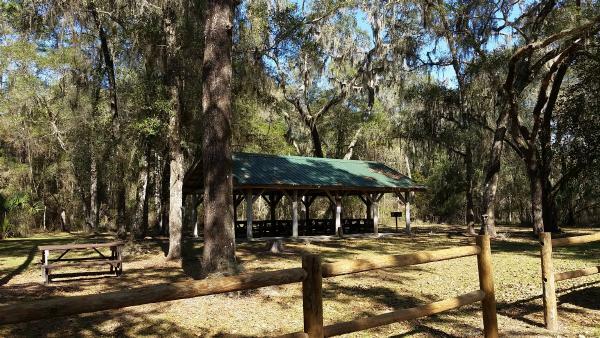 Located along US 41 north of Brooksville, This recreation area surrounds Lake McKethan - an isloated lake covering 57 acres. There is a paved one-lane multi-use trail around the lake. Vehicular use is allowed on the paved trail - providing easy access to picnic and recreation areas. There are three picnic pavilions, restrooms, and a childrens play area with swings on the far side of the lake. Numerous picnic tables are available at various places in the wooded areas along the lake shore. In addition to the paved trail, there is a 2 mile nature trail that begins near the entrance and meanders through the forest. Bicycles and horses are not allowed on the nature trail. While in the area, be sure to stop at the Withlacoochee State Forest visitor's center that is located several hundred yards south on US 41. The center is staffed full time by state forest personel and is a good place to ask questions and pick up maps and literature for other areas of Withlacoochee State Forest.